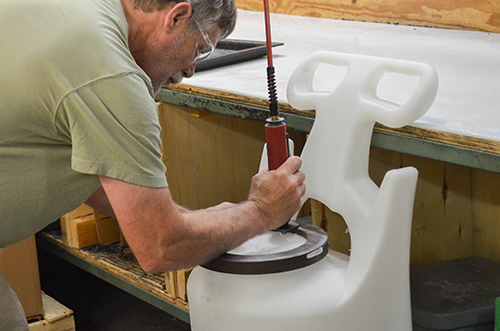 Jer-den Plastics offers a variety of secondary services, including routing, to provide the exact rotational molded parts you need. We offer a variety or routing solutions for plastic materials of all kinds. Our skilled routing team utilizes the very best routers available to ensure faster and more accurate cutting, smoother parts and rapid turn-around times. Plastic materials vary greatly in consistency and abrasiveness – from soft thermoplastics to abrasive-reinforced thermosets. A variety of different tools are required to cut and properly finish differing types of plastic materials. Additionally, different plastic materials have differing physical properties that require unique geometry for an optimum finish. We are familiar with the many different plastic materials available. We understand how to best machine each one, and we know which routing machinery will achieve optimal results for your unique part. We have the knowledge & experience to provide you with the plastic products you need – manufactured exactly the way you need them. Our routing services can offer you: volume production capability, repeatability in part production, rapid production time, and smoothness of cut-quality and finish for every product. Contact Jer-Den Plastics to discuss your rotomolding / routing project. We have the ideas, innovations & experience to produce your parts with the highest quality at the lowest cost.